Beautiful addition to remolded white and brushed nickel bathroom. My old light was old and outdated. This light added just the right touch to my new modern bathroom. It gives plenty of needed lighting, I'm very pleased with this purchase. 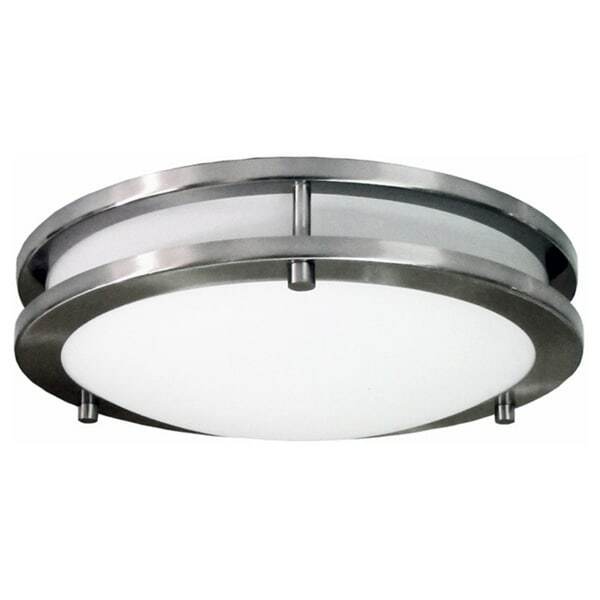 This brilliant two-light Saturn semi flush mount features a beautiful brushed nickel finish that adds transitional styling to any room. A frosted glass shade and brushed nickel finish completes the look and is sure to complement most decor styles. Dimensions 12.0 In. X 12.0 In. X 3.0 In. These lights look great and put off great light, but I deducted one star because of how they are packaged. The decorative ring at the base of the light is very thin, so it bends easily due to it being taped to the foam within the box. If the foam is jarred, the ring obtains very noticeable dents. I had this problem with a couple of my lights. I bought this light with the hanging version of it. * My kitchen is very small and low ceiling, so I decided for a flush fixture in the middle and pendants over the sink . The small size of this Saturn (12') mount is perfect for the space. If you need something bigger, there's a 17' version of this fixture. Easy to mount, works with led bulbs, and provides enough light for the kitchen. I recommend it and would buy it again. 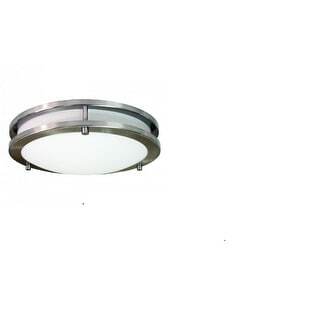 Stylish modern ceiling fixture. When used with LED lamps it is a cost effective solution. Conventional hard wired attachment to the ceiling electrical box is a quick swap with an older fixture. The nickel finish trim with matte white glass enclosure has a quality appearance. 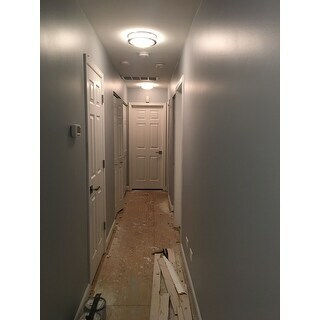 Installed to update lighting, using the 16" for the kitchen, 12" for the hallways. I was concerned the 16" (3 bulb) would not give adequate output in the kitchen , but I used 100 w equivalent LED, 2700K throughout. I prefer installing fixtures where I can change the bulb vs those fixtures that have the LED built in. They work well in a transitional/contemporary design. So why the 4/5 stars? The glass cover and the mounting ring are held in place w the 3 decorative "nuts", which means you have to juggle the cover and the ring into place, hold it up and screw in the bolts, while on a ladder. Also, don't try to screw each "nut" in all the way at once, that won't allow the other 2 to go in evenly/completely and you risk bending the ring. Not impossible, just should be included in the instructions for the novice. 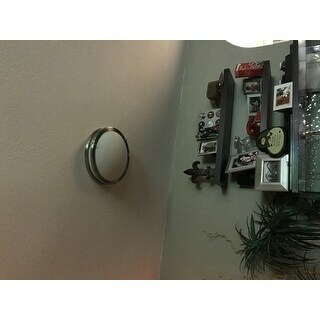 Sleek and Modern; a lot easier to install than low cost "belly-button" light. Perfect for small space. Good price after coupon applied. **Note- picture is for the 16inch one, you need this size for a bedroom. We bought a couple of these - different sizes - they look quite nice, easy to install & the HomeSelects people were wonderful when I had a question on one! this light works but is really dim. because it mounts flush to the ceiling, all the light has to come through the frosted glass. I put 100 wall equivalent bulbs in and the room where its installed was as dim as having 60 watt bulbs. The only reason for 2 stars vs 1 is that it does work and the install was easy and straight forward, just wish it didn't restrict so much light. 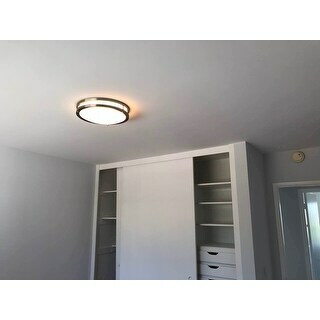 We purchased this as an affordable, modern upgrade to the standard builder light fixture. This is an older home with lower ceilings so the low profile works great. 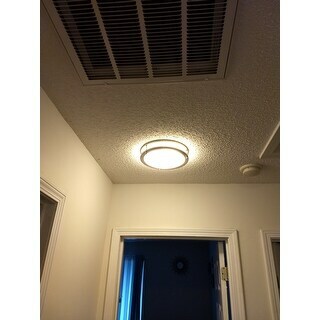 It uses 75W bulbs (2) so it gives plenty of light and the heat is minimal if you try LED bulbs. The metal seem pretty light weight to the touch but looks great once installed. Installation was simple. I did it myself (mom) with a tall step ladder, Phillips screw driver and a spare light. Easy to assemble and install Looks GREAT! Wish I ordered 2 more. We put this in our laundry room and it's a great improvement over the previous fixture. Easy to change bulbs. Nice! Love these lights! I purchased 4 for use in my hallways of my condo. They are a very high quality product and look great in my home. Love them! This light is very cool because it is so slim it is a real space saver and that was exactly what I needed. I love the shape and the ease to install it, the room is just too big for this light. It is suited to a smaller room, so other than that I love it. Simple and classic. Used in entry way and small galley kitchen. Goes with any style. These lights are beautiful! Make sure to check the size because I didn't and put in in one of our bigger living areas and it seemed too small but looks amazing in our hallways closets and other areas! The lighting is great too it's a white bright light, not yellow. Fits very tightly to ceiling. Easy ti install. 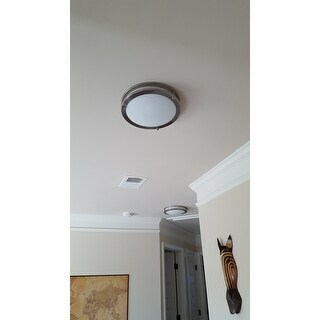 "The description says the fixture is 12" in diameter and 4" in height. The image looks more like 3" which is the size of a fixture (from another source) that looks exactly the same, that I already have. Can you please verify the measurement?" "Why is there a difference in the stated wattage? Under the details section it says it take 2 75w bulbs. Under the specs it says it take 2 60w bulbs. Which one is correct?" "Does this work with a dimmer switch?" I think that it should if you have a dimmable bulb. "How is this different than item 14715119 ?" Hello KellyKlein, unfortunately item 14715119 is out of stock. We currently do not have inventory to check, and cannot guarantee the item will be restocked. Thank you for shopping with us. It is simple and sleek.